"My people are my business." Unlike law firms and HR consultancies that typically only appear when there is a problem, our approach is to work proactively with clients, as we believe it is fundamental to reducing the incidence of disputes and adding value to the organisation as a whole. that they mitigate against the risks of getting employee issues wrong. Putting the right policies, procedures and contracts in place needn't be expensive and will reduce the risks to your business. It is also important that you look after your employees and ensure you are getting the most out of them to help you grow your business. Human Resources is about creating the right culture in your firm that will see your people deliver results that matter to them and to you. At RWA HR, we believe that the key to developing sustainable futures is to invest in your people and to create the right culture in your business. 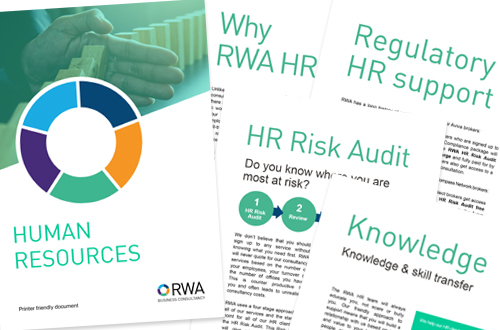 For further information on RWA HR and how it can support your business, download our brochure and submit an enquiry today.